Gtmhub enables you to easily manage the process of sharing news with your teams so you can truly collaborate on OKRs with everyone. One of the benefits of the OKR process is that it encourages conversations around what matters most to the company and the employees. Gtmhub enables you to easily manage the process of sharing news with the rest of your organisation, in a way that allows people to collaborate, discuss important topics and engage with latest events. Announcements are a great way to share the latest achievement of a team or an individual, remind everyone for upcoming company meeting or share the schedule for the upcoming holidays. Announcements are available in the People section of Gtmhub. To post an announcement, navigate to People > Announcements > New post. It will be visible to everyone within your Gtmhub account. You can choose to send email notifications to everyone or to just a few people, making sure they won't miss your announcement. Once you click the Post button, your note will appear first in the Announcements feed. All awarded badges will be also shown in the Announcements feed. 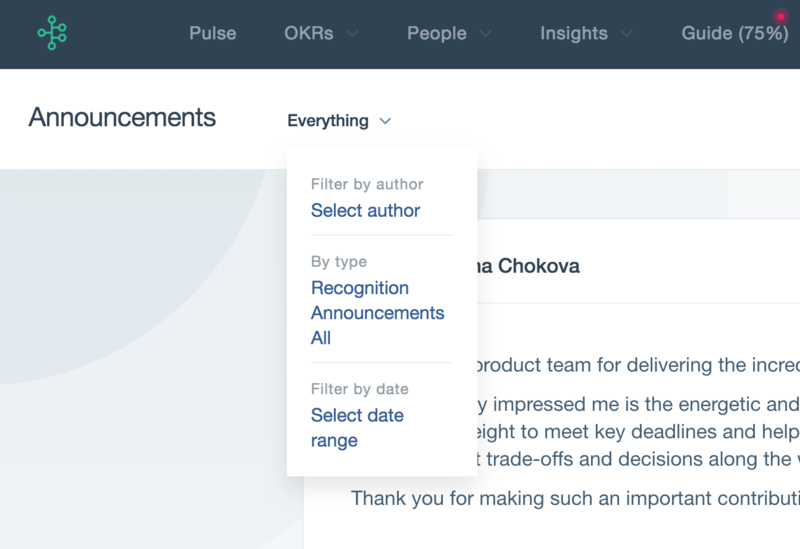 Announcements come with a range of filters to help you easily access announcements posted by your manager, HR team member or the office coordinator. To do this, choose Filter by Author and select the person (or people) you want to filter by. Gtmhub also allows you to filter by type - whether you'd like to see only badges, announcements or both. And by a time period - Select date range. You can also use these multiple filters at the same time. Gtmhub also provides permissions on who can post announcements. By default only users with an admin role will be able to post announcements. You can easily give access to people from the Human Resources team or team managers and leads to do so. To allow a team member to post announcements, you'd need to assign them with the pre-defined HCM role. Navigate to Setup > Users. Select the user/s that you want to assign the role to and choose the HCM (Human Capital Management) role. 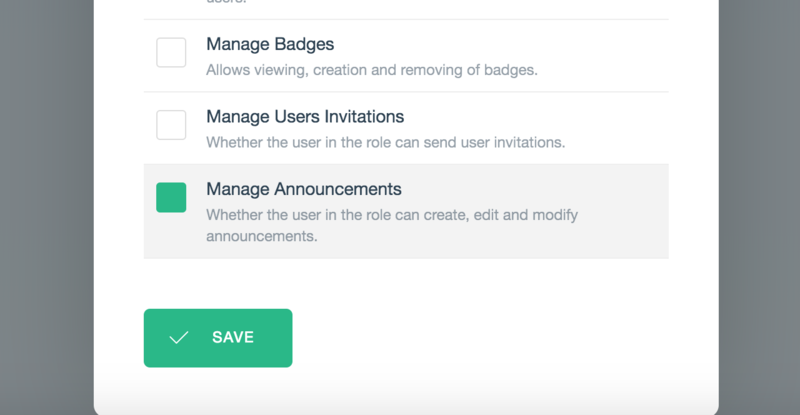 In case someone is assigned with a custom role, edit the role and make sure that Manage Announcements is ticked.